Guest: Robert Thurman is one of the world’s foremost Buddhist scholars, a long-time friend of the Dalai Lama, the father of actress Uma Thurman, and a teacher of Tibetan Buddhism and related cultures. He is an eloquent advocate of the relevance of Eastern ideas to our daily lives. In doing so, he has become a leading voice of the value of reason, peace, and compassion. Thurman was named one of TIME magazine’s 25 most influential Americans and has been profiled by The New York Times Magazine and People magazine. He is the author of many books and played a central role in the new graphic biography, Man of Peace: The Illustrated Life Story of the Dalai Lama of Tibet. Story: After losing an eye in an accident at a young age, Thurman was suddenly confronted with impermanence and death. 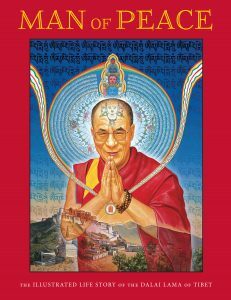 Shortly after, he embarked on a life-changing journey and exploration of Tibetan Buddhism and culture, building a close relationship with the Dalai Lama, and becoming a prominent Buddhist teacher and scholar. Big idea(s):  A lot of spirituality is skewed into an idea of escaping from relationship and transcending into some vastness. What if that vastness existed already in the life you were already living, but you just didn’t see it? Every relative thing is empty of any non-relative element. By knowing reality, you transcend the idea that you’re more special than others, and their heartbeat becomes as important to you as your own. Why Bob abandoned his education in the spring of his senior year of high school. A graphic novel biography of Dalai Lama – story of one man taking on an empire, calling for truth, peace, and justice for his Tibetan people.